This performance with the New York Philharmonic and Rodzinski was in memory of Rachmaninoff who died earlier that year. Some of the playing is not just amazing, I'd have thought it impossible if I hadn't heard it. Horowitz was an astounding artist and achieved a peak in his career quite early. 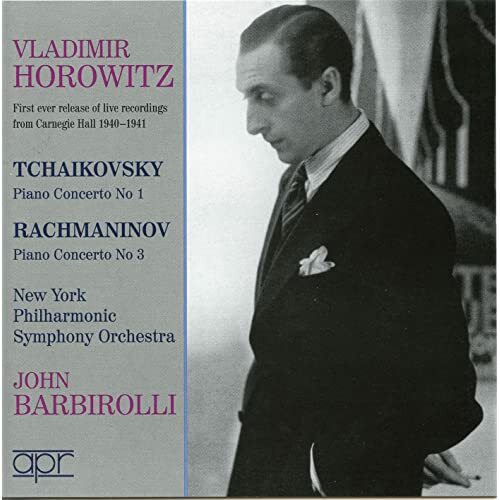 I've listened to the finale of Barbirolli/1940-41, which is on YouTube, and it's essentially the same interpretation of the music, but sometimes Horowitz sounds like he's on the verge of losing control, while in 1943 he's secure at the same extraordinary tempos. Either performance would be the making of any other pianist, of course. IMHO Rodzinski is the better conductor, while the young Barbirolli was probably conducting the music for the first time. At any rate, I find Barbirolli's fussing with tempo in every new musical idea quite annoying: he never seems to find a firm footing, while Rodzinski is rock solid, thus making Horowitz feel more secure in his playing. I note in passing that Horowitz's playing in the commercial release (Reiner) is again rock solid. Horowitz's tempos in the RCA Victor recording are less precipitous than in these live performances of 8-9 years earlier; the timing with Reiner is five minutes longer. Rodzinski prided himself in always being exactly with the soloist in concertos, and he and Horowitz are certainly at one in the Rachmaninoff. There's a story I may have told here before, of when Josef Hofmann was to play the Emperor Concerto in Cleveland during Rodzinski's time there. Word reached Rodzinski that his fellow Pole was determined to wrong-foot him at the end of the finale so that the orchestra would come in late. Rodzinski had Boris Goldovsky, the orchestra's pianist at the time, play the last solo in every possible and impossible way to help Rodzinski be ready for anything. On the night, however, Hofmann played that passage so eccentrically, with speedings up and slowings down and a rush up the final octave, that despite everything the orchestra couldn't help but come in a split-second late. Not very professional of Hofmann, certainly, but it tells us something about Rodzinski's attitude toward concerto accompaniment. Does anyone know if this performance was ever issued on CD? Seems like I would have had it, but don't see it my lineup nor can I find any reference to an actual CD available commercially. It seems to me this would be a great seller. I have all of Horowitz's other Rach 3 recordings. One might have thought Sony would have issued this in their 50-CD set of "The Unreleased Live Recordings," which covered 1966 through 1983. That would have been an added "bonus" for that box. Thanks ! Yes, amazing. I have his recordings with Coates and Reiner, have heard his 1978 with Ormandy and a live 1977 in Michigan. I have not heard the 1941 with Barbirolli,To date, my fav remains the Cliburn live 1958 at Carnegie with Kondrashin, but I'll now have to hear the 1941 as well. A part of the 2nd Mov. of the 1943 with Rodzinski is missing from the YT, perhaps why no lp or cd of the 1943 I could find ? Ypu may a good point about a segment missing. Sometimes, when that happens, a segment ifrom another performance is spliced in for the missing part(s) and the disc is still issued with a note to the change. I'll keep my eyes peeled as I would enjoy having that Rodzinski one. A part of the 2nd Mov. of the 1943 with Rodzinski is missing from the YT, perhaps why no lp or cd of the 1943 I could find ? Off-the-air recordings are sometimes incomplete or otherwise defective. A friend recently played me the Horowitz/Rodzinski broadcast which wasn't missing that bit of the 2nd movement and has better sound than the YouTube clip - he said it wasn't recorded off the direct line from Carnegie Hall to NBC. He was making a digital transfer from the transcription discs for the NY Philharmonic's sound archive. Now that they have it, maybe they will publish it or make it available to Sony/Classical. Or one can audition it at the archive, which is in the Rose Guilding across 65th Street from Lincoln Center. Lance, if you like you can record Horowitz/Roszinski from YouTube using a free Firefox extension such as Flash Video Downloader, then burn it to a CD - a place-holder until a better version comes along. The overwhelming sensation of this concert was Vladimir Horowitz's performance of Rachmaninoff's Third Piano Concerto. The performance was one in which the conductor shared the interpretive burden with the pianist, to the concerto's great advantage. The effect was colossal. Mr. Horowitz's pre-eminence as a virtuoso needs no emphasis here. To speak of his technique would be superfluous and, if not accompanied by mention of his sovereign musicianship, would be impertinence. This was in every respect great playing, not only greatness of physical power but greatness of spirit. Rachmaninoff wrote this concerto for himself; it can also be said that he wrote it for Mr. Horowitz. Mr. Horowitz was close to Rachmaninoff, to composer and the man. It is reasonable to suppose that something of an act of reverence and devotion was in last night's reading. It can fairly be said that at the moment, where interpretation was concerned, the pianist wore Rachmaninoff's mantle. At the risk of seeming extravagance, we shall add that this performance was of a stature and a thrill which suggested an heir to the mantle of [Anton] Rubinstein. Mr. Rodzinski was likewise fortunate in his collaborating artist and in the fact that the prowess of the soloist made it possible for him to devote his whole attention to interpretation and in so doing to release the entire resources of the orchestra. With unlimited sonority, power and splendor the concert, introduced by the simple little tune in the manner of a Russian folk-song by the piano, swept to its culmination, and it was inevitable that with the last note the audience rose to its feet and yelled. This was indeed music in the grand style. Incidentally, the first part of the concert included Gliere's Ilya Murometz symphony which runs well over an hour. The audience certainly got a lot of music for their money. This is a delicious story!! And I've only listened to the first movement of the Rach #3 with Horowitz (my bacon and eggs are ready!) and already he's ahead of the orchestra!! But his flexible treatment of light and shade is staggering!! The keyboard chiaroscuro-ist!! Indeed, amazing how quickly the tempo changed in the first movement. It didn't take Rodzinski long to "get going," either! Apparently Horowitz wasn't happy with the starting tempo, either that, or it was pure nerves. Maybe a bit of both. Neither. It's written in the score, "piu mosso," which means faster. and a bit later "piu vivo," which means more lively. Of the countless performances I have heard on recordings, this one was obviously pushed to the hilt with the tempo change. I had the impression that even Rodzinski had to step on it more than he wished, however, he did follow the pianist. Even Rachmaninoff doesn't play it like this. Nonetheless, it was exciting since it's well known that you never knew for sure what Horowitz would do with orchestras. In this case, it seemed overdone for my ears. Schonberg wrote: The Horowitz/Steinberg was never recorded, but a few happy collectors have a copy of the May 4, 1941 performance of the Rachmaninoff Third, taken from a New York Philharmonic broadcast performance with Barbirolli. Presumabely it would not have been substantially different in conception and execution from the "dream" performance that Rachmaninoff saluted some fifteen months later. It goes at an exceptionally fast clip, much faster than anybody today would dare to play it. Nor is it possible to think of a pianist who could, at that tempo, articulate with the precision that Horowitz brought to it. Yet, with all the speed, Horowitz has time to dwell lovingly on the lyric elements and shape them with a master hand. The dash and élan of the finale are breathtaking. If a performance like this impresses modern listeners as too fast, too virtuosic, it cannot be emphasized often enough that tempos were prevailingly much faster half a century ago, and today's slow tempos actually misrepresent the music. Schonberg wrote: The performance in May 1942 is wild. Horowitz storms through it faster than any player before or since. His timing is 32 minutes, 53 seconds. [That's within seconds of the Rodzinski performance allowing for the break in the recording in the 2nd movement.] The performance is about ten minutes faster than the 1990s norm. One's first impulse is to say, "Too fast. Ridiculous." Then one listens again, notices that every note is perfectly articulated, gets caught up in the visceral excitement, responds to the loving shape of the lyrical elements, is floored by a technique of supreme mastery, and surrenders - gladly. Rachmaninoff's own recording, possibly with more cuts than Horowitz took, is not much slower, and in places such as the very beginning it's faster; the timing is 33:52. It's not the tempo markings per se but whether or not the pianist strides ahead of the orchestra. I would have thought these things would be ironed out in rehearsals; in any event, the Horowitz Rach #3 (New York Philharmonic and Rodzinski) is not unlike the conductor of an opera or ballet, with the orchestra in the pit and the artists on a platform above it. At least the pianist is sitting right with the orchestra and should be listening to it, and watching the conductor!! All the same, I did enjoy this performance. Belle, would you tell us exactly where you think Horowitz and Rodzinski aren't together? Give me the timing where you think you hear that. I've listened to the first four minutes of the first movement and Rodzinski is with Horowitz through several tempo changes, those marked in the score. In other words, I don't hear what you say you're hearing, but if you point me to it, maybe I will. In the first movement it sounds sometimes as though the orchestra is playing catch-up, but this is subtle. 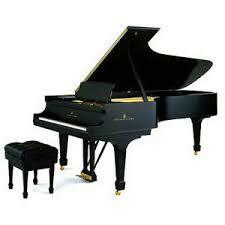 It occurs in the first part as soon as the piano goes off on a virtuosic tangent!! Sometimes the orchestral line becomes very unclear and a little confused. It was enough for me to become aware of it but, as I say, I did enjoy the performance. I wonder if others here noticed it too? You do hear this very occasionally too in live concert performances. The recorded sound is far from clear, especially when the orchestra is involved, and the balance strongly favors the piano. Even so, in the passage beginning at 0:50 which I believe is what you're talking about, when the strings repeat the opening theme under the piano's 16th notes, at a slightly faster tempo as in the score (piu mosso), I hear them as exactly together, as far as I'm able to hear the orchestra at all. Well, there it is. You're certainly right that in live performance, especially with as individual and spontaneous a soloist as Horowitz, the conductor may have a job keeping everything together. Rodzinski began in Poland as an opera conductor so he had plenty of experience at dealing with soloists' vagaries.